This armored amphibian is capable of sailing like a car moving at a speed of 120 kilometers per hour on a highway. 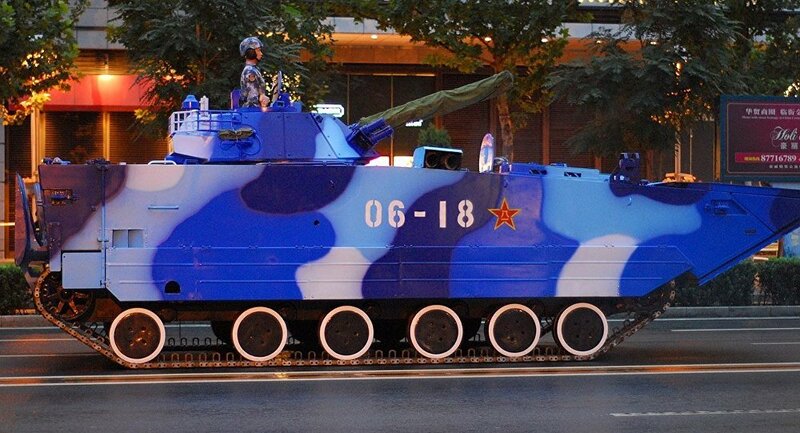 China Central Television Station (CCTV) has published a video of the VN18, which the television channel described as the fastest amphibious assault vehicle in the world. According to CCTV, the VN18 is capable of sailing at a speed of up to 30 kilometers per hour, while the vehicle's maximum ground speed stands at 65 kilometers per hour. "On the waters, it's like a car running at 120 km/h on a highway," Tan Yongyao, manager of R&D at the Chinese weapons maker Norinco, was quoted by Chinese Global Television Network as saying. The 26.5 metric ton vehicle, which carries 11 soldiers on board and is armed with a cannon, a machine gun and an anti-tank missile, was touted by Norinco as "the strongest of its kind." The vehicle is reportedly a modified version of China's ZTD05 Light Tank, developed in the early 2000s.